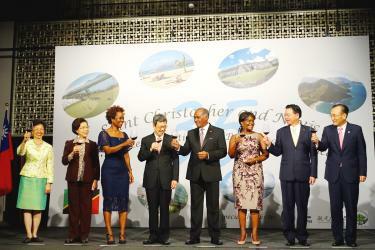 “Those friends thou hast, and their adoption tried, grapple them to thy soul with hoops of steel,” Saint Kitts and Nevis Senior Minister Vance Amory said, quoting William Shakespeare, at an event in Taipei on Wednesday evening to mark the 35th anniversary of the establishment of diplomatic ties with Taiwan. The event was held alongside celebrations of the 35th anniversary of the Caribbean nation’s independence at a ceremony at the Regent Hotel, with musical performances, glasses raised and local delicacies served to commemorate the occasion. Looking back at the 35-year friendship between Taiwan and Saint Kitts and Nevis, Amory said his nation has benefited greatly from support and assistance from Taiwan in the areas of education, infrastructure, technology and agricultural development. In return, Saint Kitts and Nevis has repeatedly and consistently lent its support to Taiwan in the international arena, said Amory, who is also minister of Nevis affairs, labor, social security and ecclesiastical affairs. He led a delegation on a visit from Thursday last week to yesterday. “We feel that we can lend a voice whenever an opportunity arises at the UN or WHO, or wherever there are issues related to nationhood, democracy and independence, we will show support for Taiwan,” Amory said. Saint Kitts and Nevis Ambassador to Taiwan Jasmine Huggins said that people-to-people exchanges was one aspect her nation would like to see increase. “We have robust government-to-government exchanges, but we can increase people-to-people exchanges. 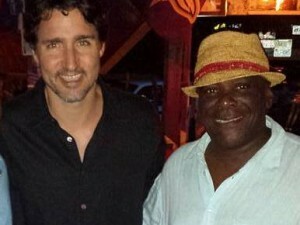 When a person comes here or goes to St Kitts, they become an ambassador for the[ir] country,” Huggins said. Despite China’s efforts to poach diplomatic allies, which has seen five switch allegiance from Taipei to Beijing since May 2016, Amory and Huggins expressed confidence in the stability of relations between Taiwan and Saint Kitts and Nevis. Amory said his government deplores what seems like dollar diplomacy by Beijing, loaning massive amounts to Taiwan’s allies to attract their support. “We have seen the impact of that. Some countries, because of [loan] default, are now held hostage and can do nothing,” Amory said, adding that China is apparently seeking to create a new international hegemony and a new form of colonialism using its wealth. Given Saint Kitts and Nevis’ history of colonization, Amory said his nation values its independence and the democratic process. “We are not going to allow loans from any country to again return us to a colonized state,” he said. Huggins said Taiwan has been a true friend and has extended its friendship without strings attached.